I'm known to carry around everything and the kitchen sink with me on a daily basis! I guess, I just like to come equipped for any situation that may arise. Here's an insight into what's inside my daytime purse. My number one essential and the source to all my creativity. I love searching the internet for inspiration, taking photos of my day and of course my slight obsession with Instagram. Just the general bits and bobs in here: licence, credit cards, loyalty cards, money (if I'm lucky)and bandaids. I'm such a note taker, list maker and organiser. I like to keep my diary up to date with upcoming events, assignment due dates etc. And I keep a blank note book to jot down any brilliant ideas for posts or shopping lists. Can you blame a girl for wanting options!? A must for keeping that harsh Sydney sun out of your eyes while driving. Love a big pair of sunglasses! I always keep some hand cream and mints in my purse ~ cracked, dry hands and bad breath just isn't cute! I usually keep at least one of these in my bag to re-spritz during the day. I love the sweet floral body mists from Victoria's Secret. A must during Summer! No matter how much effort I put into my hair, during those warmer months I always end up sweeping it off my face and into an up-do by the end of the day. You never know when you or a friend may need one of these suckers! For that unwelcome headache or when 'that time of month' cramps arise. This cute little device allows you to hang your handbag off a restaurant table, rather than putting it on the dirty floor, which I'm sure a lot of us are guilty of. 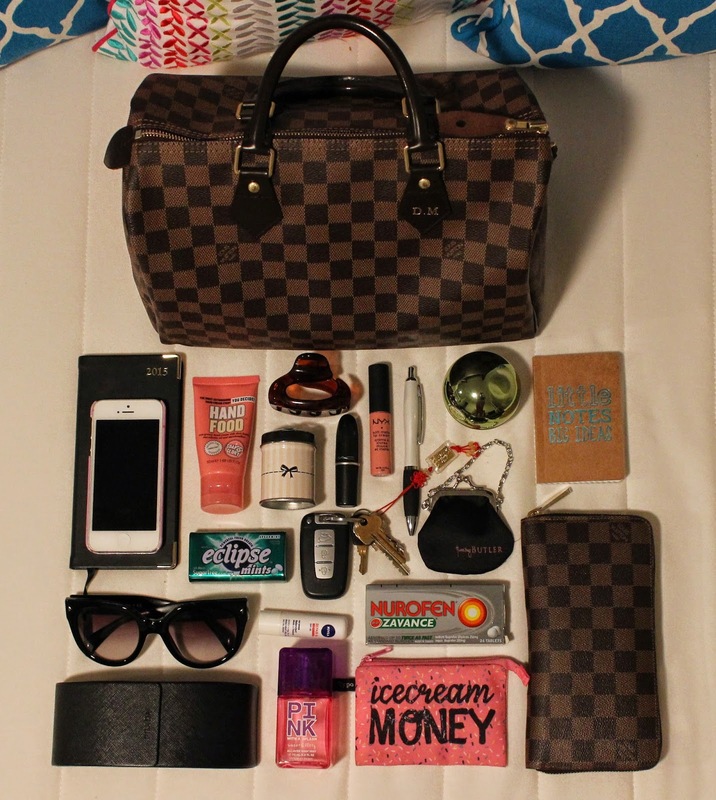 Let me know what your daily handbag essentials are!